Perkee fairtrade coffee was recently shortlisted by the Sustainable Restaurant Association (SRA) in the Food Made Good Awards for their support global farmers award. We were nominated alongside The Breakfast club and Plymouth University. We were thrilled back in September when we heard we had received this nomination and looked forward to the exciting award lunch and meeting all the winners. Miguel Camara, our coffee brands manager and I were treated to a delicious lunch, curated by Raymond Blanc, OBE and beautifully served by graduates of The Clink. The Clink is a life-changing charity who embodies everything the SRA stands for, they currently operate four restaurants at Her Majesty Prisons. We weren’t the winners for our category, congratulations to The Breakfast Club for ensuring all their avocados come with a Fair for Life assurance. They serve A LOT of avocados, so they are making a big difference. But we won in other ways; listening to all the shortlisted candidates and winners in the 17 categories really was inspiring. 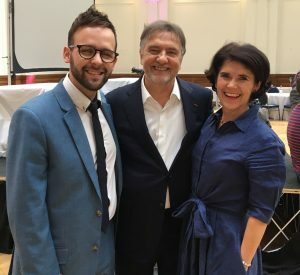 We also felt lucky to listen to Prue Leith and Raymond Blanc, OBE. Not many years ago sustainability was out on the edge, alongside brown sandals and alfalfa sprout sandwiches. But it struck me as I sat listening to Prue and Raymond that sustainability is mainstream now. To see these giants of our industry talking about sustainability, its importance and why it’s good for business, people and the planet, made me feel proud that I work for a business that shares and lives this ethos. 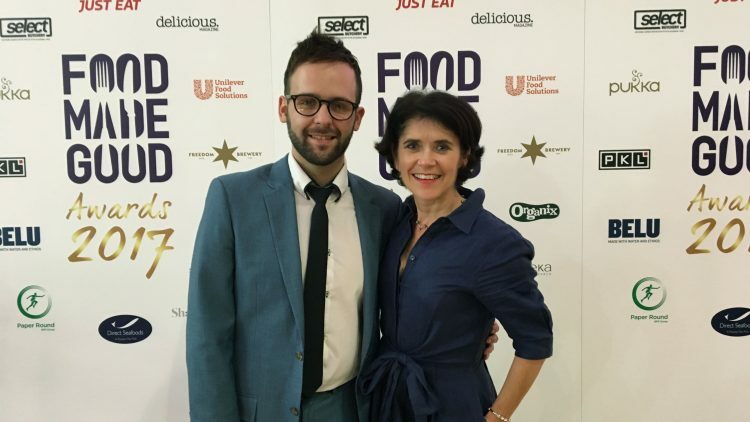 I am so glad the SRA have forged ahead and driven the agenda, taking action, driving up standards, sharing best practice and recognising food heroes. Talking of food heroes, this year the SRA President’s Sustainability Award went to Henry Dimbleby and John Vincent, founders of Leon. Their School Food Plan introduced free school meals for all infant pupils and was responsible for the return to the curriculum of cooking lessons. I feel very strongly that young people must learn to cook, so I was delighted they received this recognition. Miguel and I left determined to do even better this coming year. We were like magpies picking up great ideas from all sorts of people in different businesses within the catering industry. So even though we didn’t win, we still did win in many other ways. We felt good about how Perkee coffee is supporting the Soppexcca cooperative community in Nicaragua. Being recognised by the SRA provided a feelgood factor for our team and our clients and definitely enhanced Perkee’s reputation. Many people came up to us to talk about Perkee after the lunch. The awards lunch provided a great opportunity to network and meet other like-minded people. So winning, to use a food metaphor would have been the ‘cherry on top’, but we gained in so many other ways. We are looking forward to working with the Sustainable Restaurant Association in the year ahead to improve what we do and be a positive food force for good.